Certain patients with an advanced form of breast cancer in the EU will now have access to Roche's Perjeta after the medicine was approved in the region. The Switzerland-based pharma company said Perjeta (pertuzumab) was approved in combination with Herceptin (trastuzumab) – also marketed by Roche - and docetaxel chemotherapy to treat adults with HER2-positive metastatic or locally recurrent breast cancer that cannot be operated on. These patients should also have not received previous anti-HER2 therapy or chemotherapy for their condition. HER2-positive patients have breast cancer cells with a very high number of HER2 receptors, which stimulate the growth and division of cancer cells. It is thought HER2-positive breast cancer accounts for between 15 and 25 per cent of all forms of the condition in women. Dr Hal Barron, chief medical officer and head of global product development at Roche, said the approval was the results of “years of research into the HER2 pathway”. “The combination of Perjeta, Herceptin and chemotherapy is the first to significantly extend survival compared to the previous standard of care, Herceptin and chemotherapy alone," he added. The approval follows a recommendation from an advisory committee to the European Medicines Agency (EMA) in December 2012. This recommendation was based on data from the phase III CLEOPATRA study, which demonstrated that when Perjeta was added to the combination of Herceptin and docetaxel, it reduced the risk of progression-free survival (PFS) by 34 per cent. The CLEOPATRA study also supported the drug's regulatory submissions elsewhere, with the drug approved for a similar indication in the US in June 2012 and Switzerland in August 2012. 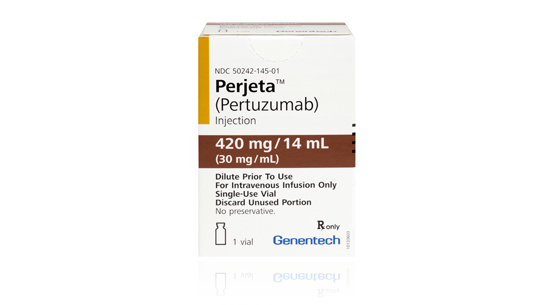 Analysts have previously predicted sales of Perjeta could reach $600m to $1bn within the next five years, helping to alleviate the impact of generic competition to Herceptin, which will start to lose patent protection in 2014. However, the high cost of Perjeta plus Herceptin – about $188,000 for a standard 18-month treatment – could limit its use in European countries implementing austerity measures in healthcare.